McCain adviser: "She is a diva. She takes no advice from anyone"
(CNN) -- Some aides to Sen. John McCain say they weren't happy that running mate Sarah Palin went off script Sunday and turned attention back to the controversy over her wardrobe. Alaska Gov. Sarah Palin deviated from her prepared remarks to talk about her wardrobe controversy Sunday. The Alaska governor on Sunday brought up the recent reports regarding the Republican National Committee's $150,000 spending spree on clothing and accessories for the Palin family. Palin denounced talks of her wardrobe as "ridiculous" and declared emphatically: "Those clothes, they are not my property." "Just like the lighting and the staging and everything else that the RNC purchased, I'm not taking them with me," she said at a rally in Tampa, Florida. A senior McCain adviser told CNN that those comments "were not the remarks we sent to her plane." Palin did not discuss the wardrobe story at her rally in Kissimmee, Florida, later in the day. A Palin aide, however, told CNN that the governor clearly felt like she had to say something to defend herself, because "that's really not who she is." 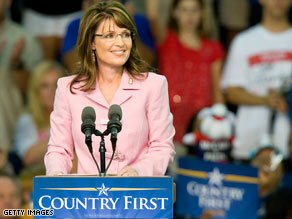 Over the weekend, sources told CNN that long-brewing tensions between Palin and key aides to McCain were on the rise. Several McCain advisers suggested that they have become increasingly frustrated with what one aide described as Palin "going rogue." "She is a diva. She takes no advice from anyone," this McCain adviser said. "She does not have any relationships of trust with any of us, her family or anyone else. But this Palin source acknowledged that Palin is trying to take more control of her message, pointing to an impromptu news conference on a Colorado tarmac last week. CNN contributor and Republican strategist Ed Rollins said Palin was "mishandled" during the earlier part of the campaign, and as a result, "she's become a target of a lot of ridicule." But, he said, "She definitely is going to be the most popular Republican in this country when this thing is over." The Politico reported Saturday on Palin's frustration, specifically with McCain advisers Nicolle Wallace and Steve Schmidt. They helped decide to limit Palin's initial media contact to high-profile interviews with Charlie Gibson of ABC and Katie Couric of CBS, which all McCain sources admit were highly damaging. But two sources, one Palin associate and one McCain adviser, defended the decision to keep her media interaction limited after she was picked, both saying flatly that she was not ready and that the missteps could have been a lot worse. Jack Kemp's aides distrusted the Bob Dole camp and vice versa, and Dan Quayle loyalists had a list of gripes remarkably similar to those now being aired by Palin aides. CNN's John King and Peter Hamby contributed to this report.